July 31, 2013: Mali's Festival au Désert is an annual concert, held near Timbuktu since 2001. After a nationalist uprising in Mali in 2012, the festival was canceled this year, but a selection of its performers will play tonight at New York's Damrosch Park for free, as a part of the Lincoln Center Out of Doors series. Tartit, whose profile from FADER's 2008 Africa issue we're publishing online for the first time below, will be among them. 2008: What I mostly remember of Tartit is their pastel kaftans. I saw them five years ago on the National Mall in DC, and while apparently the men in the group danced with swords, I don’t remember that. Instead I recall the trilling of five seated women with swaying torsos. This is no slight to the non-choral/non-female members of the group, but simply a testament to the weird incanting power of Tartit's mystical yip. Though some of Tartit’s members are not professional, about half of the group is. Their origins are fuzzy in prior press, some saying that they met in refugee camps, but Ourmar corrects this. “We knew each other before,” he says. “We met a Belgian woman who asked us if there was a group of Tuareg women playing music. We said, ‘No, but let's give it a try.’” This combination of Making the Band and desert music evolved into a diverse merging of Malian styles. “We're very proud to come ‘from the outside’ and be the ambassadors of our culture,” says Ourmar. And while in some ways they are clearly ambassadors—releasing music on the Belgian label Crammed that may not otherwise be heard outside of Mali—Tartit truly exists in a culture of nebulousness. There is no definitiveness to relay. 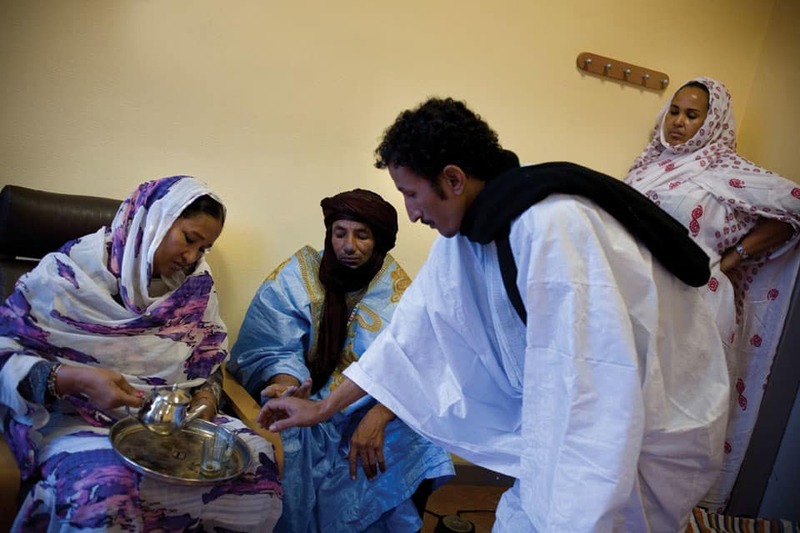 “You know, for us Tuaregs, the future is in the hands of God,” Ourmar says, and without any other Earthly guide, that loose spirituality will continue in their music.